Did you know that almost all of New Zealand's First World War memorials were paid for by local communities, schools and work places? In the middle of Dunedin, the town where I was born, stands a cenotaph – a tall tower of white Italian marble. As a young person I visited the cenotaph in Queens Gardens with my grandparents for the Anzac Day dawn service. It was cold, I remember the sun rising, I don’t remember ever reading words on the cenotaph, or really taking much of it in, I don’t remember any symbols, except a bowl of some sort right at the top. The architects Gummer & Ford designed the Dunedin memorial in 1921, a few years after the end of the First World War. 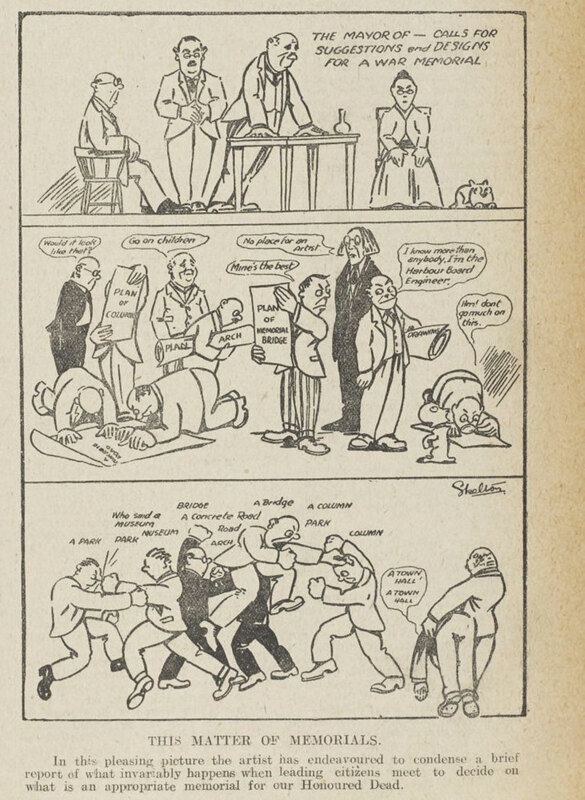 It was one of 63 entries to a competition for designs of ‘great artistic merit’ that aimed to ‘fittingly symbolise the deeds and commemorate the deaths of our soldiers fallen in the Great War.’ The competition organiser was not fond of many of the designs, which he thought reflected ‘abject despair’ of a ‘vanished people.’ The design that was chosen instead represented triumph, proud manhood and great deeds and sacrifices. It was known as the citizens’ memorial, no names were inscribed, and symbols on the stone represented victory, eternal life, women and peace. The bowl at the top is a symbolic beacon. Following the Great War, the government was unable to fund war memorials throughout the country – they were spending a large sum of money on costs associated with maintaining overseas graves and rehabilitating tens of thousands of returning soldiers. There was a general belief that war memorials should instead be paid for by voluntary efforts. ‘Soldiers had sacrificed themselves for their country, and therefore the community should make some special sacrifice to commemorate them,’ wrote historian Jock Phillips. Community groups were created to raise funds for the various memorials across the country, and fundraising frequently became a competition between towns. Groups were often led by women, in many cases the same women who had fundraised for the war effort itself. In some small towns, people were contributing, on average, 10 shillings per head (about $41 today). When you consider that for many, times were tough, that is a lot of money. The form the memorials were going to take was a controversial subject, negotiated through community meetings, calls in local papers and by architects and stonemasons. Many – especially government officials – thought that memorials should be ornamental, rather than practical, in order to better symbolise victory, sorrow and sacrifice. While some utilitarian structures, like halls and bridges, were built, it is said that “not many communities infringed that taboo”. 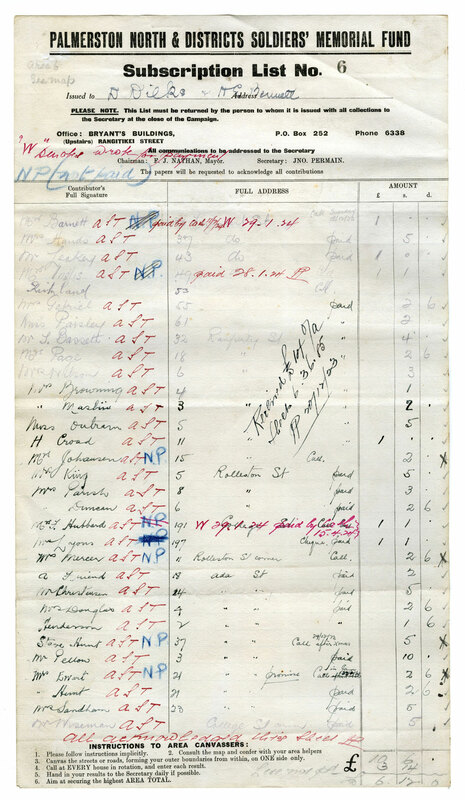 A canvassing sheet for the Palmerston North memorial. Image courtesy of Palmerston North City Library. Communities built sets of street lamps, band rotundas, arches and obelisks. They planted rows of trees, and in schools all over the country they gathered objects, created Rolls of Honour and built their own memorials. There was much debate about how the nation as a whole would commemorate the First World War and those who died while serving in it. Some wanted a memorial road, others a memorial cathedral. 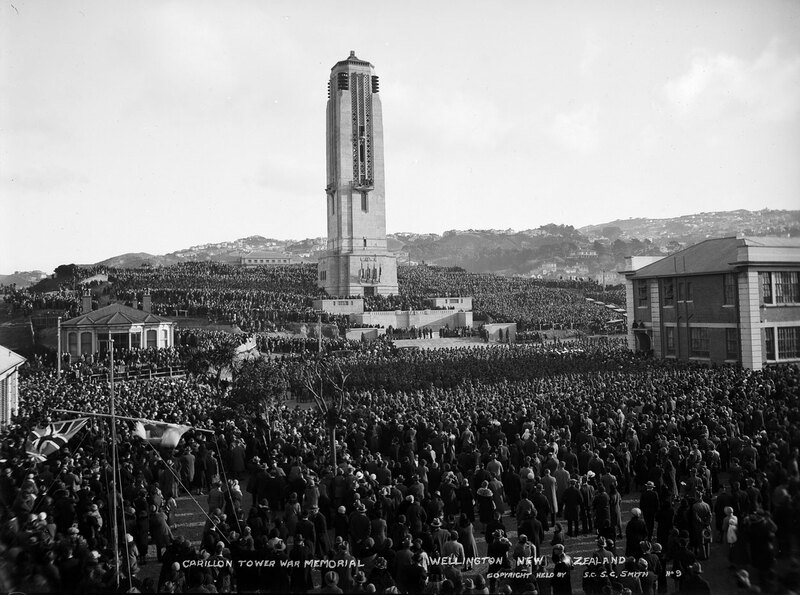 Eventually it was decided that a carillon, or tower of bells, would be the memorial and it would be located alongside a national art gallery and museum in Mt Cook in Wellington. The bells were to be played on the anniversary of battles, encouraging the listeners to remember the fallen. Gummer & Ford also provided the designs for the National War Memorial, where I now work as an Educator at the Pukeahu National War Memorial Park. The idea for a carillon as the National War Memorial was sparked by a Wellington jeweller and optician, P. N. Denton. While the Government were not initially committed to the idea, prominent Wellington citizens pushed on, even going so far as to order the bells made before a building was agreed to. They were eager as well as innovative, selling 49 individual bells to fundraise for the costs. The most expensive, reo wairua, was sold for £1,440 ($131,000 in today’s money) the smallest bells sold for £25 (almost $3,000 in today’s money). The idea was so popular they sold out in a week and they asked people to get together to buy collective bells. These included bells to nurses, public servants and railway workers. One of the bells is dedicated to Leslie Beauchamp, brother of New Zealand writer Katherine Mansfield. His bell reads “Only Son of Harold and Annie Burnell Beauchamp,” who donated the funds for the Flanders Fields bell. Katherine was close to him, and wrote a poem about his death where she describes a dream she had about him, in the dream, he eats poisonous berries. All the original bells in the National War Memorial’s carillon were fundraised by the community for the community, as were most of the war memorials that cover every corner of Aotearoa. So what memorials are in your area? Who paid for them? How much did they cost? And have there been any new memorials built in your community in the centenary period?